Dust emission and transport associated with Saharan depressions: The February 2007 case. The dust activity over North Africa associated with the Saharan depression event in February 2007 is investigated by mean of spaceborne observations and ground based measurements. The main characteristics of the cyclone as well as the meteorological conditions during this event are described using the European Centre for Medium-range Weather Forecasts (ECMWF). The dust storm and cloud cover over North Africa is thoroughly described combining for the first time Spinning Enhanced Visible and Infra-Red Imager (SEVIRI) images for the spatio-temporal evolution and Cloud-Aerosol Lidar and Infrared Pathfinder Satellite Observation (CALIPSO) and CloudSat observations for the vertical distribution. The Saharan depression formed over Algeria in the lee of the Atlas Mountain on the afternoon of February 20 in response to midlatitude trough intrusion. It migrated eastward with a speed of 11 m s-1 and reached Libya on February 22 before exiting the African continent toward the Mediterranean Sea on February 23. 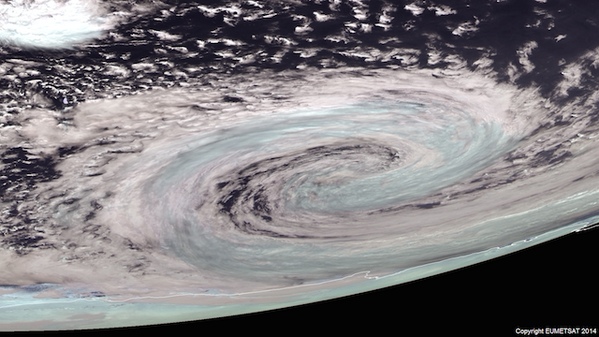 The horizontal scale of the cyclone at the surface varied between 800 km and 1000 km during its lifetime. On the vertical the cyclone extended over 8 km and a potential vorticity of 2 PVU was reported on its centre at 3km in altitude. The cyclone was characterised by a surface depth of 9 hPa, a warm front typified at the surface by an increase in surface temperature of 5°C, and a sharp cold front expressed by a drop in surface temperature of 8°C and an increase in 10m wind speed of 15 m s-1. The cyclone provided a dynamical forcing that led to strong near-surface winds and produced a major dust storm over North Africa. Heavy dust load was seen along the cold front and the southeastern edge of the cyclone accompanied by a deep cloud band along its northwestern edge. The dust was transported all around the cyclone leaving a clear eye on its centre. On the vertical, slanted dust layers were consistently observed during the event over North Africa. Furthermore, the dust was lofted to altitudes as high as 7 km, becoming subject to long range transport. Key Words: Mediterranean cyclone, CloudSat, ECMWF, North Africa, Sharav cyclone, CALIPSO. Bou Karam D., C. Flamant, J. Cuesta, J. Pelon, E. Williams (2010): Dust emission and transport associated with a Saharan depression: The February 2007 case , J. Geophys. Res., doi:10.1029/2009JD012390.